In 2002 we introduced the R-122, the world’s first phantom powered, active ribbon™ microphone. It was a revolutionary development in ribbon mics, combining impedance matching circuitry with condenser-like output levels that allowed the R-122 to be used on even the quietest sound sources. It also allowed the mic to be paired to virtually any preamplifier. The R-122 MKll takes the R-122 to a whole new level, delivering unprecedented flexibility for ribbons via the addition of a switchable -15 dB pad and a switchable bass-cut filter. The switches are completely out of the circuit when disengaged so when both are off, the microphone is for all purposes an original R-122. The switches are located on the back of the microphone and recessed to prevent accidental activation. The R-122 MKll’s switchable -15 dB pad is positioned before the microphone’s electronics and, when engaged, eliminates any potential for headroom-related distortion on even the loudest sound sources. Wide open electric guitars are no problem. With the pad in, the R-122 MKll’s output is actually 2 dB lower than our flagship R-121. The R-122 MKll’s well-designed pad has no sonic imprint. Once levels are matched, the R-122 MKll reproduces sound exactly the same with the pad in as with the pad out. When switched in, the R-122 MKll’s bass cut starts filtering at 100 Hz, 6 dB per octave, effectively reducing the mic’s bass buildup due to proximity effect. This smooth filter is extremely useful on vocals, many acoustic instruments, and close-miked electric guitars when less bottom end is desired. The R-122 MKll’s electronics are hand-wired in our Burbank, CA factory. The microphone utilizes a special Royer-designed toroidal transformer that delivers a faster transient response then traditional ribbons, making it a first call ribbon mic for drum overheads, percussion and all acoustic instruments. Conventional ribbon microphones need high-quality, high-gain microphone preamplifiers to record softer sound sources. The R-122 MKll’s output level is much higher, allowing you to use practically any mic preamplifier or board pre’s to record even the quietest sounds. The R-122 MKll contains a fully balanced, hand-wired, discrete head amplifier system utilizing a specially wound toroidal transformer and ultra-low noise FET’s. This system is extremely quiet and brings the R-122 MKll’s sensitivity to 37 dB, all while allowing for high SPL recording! Go ahead and plug a MKll into any preamp with average gain – you’ll get full Royer performance and enough level to drive any recording medium. There is no increase in self-noise in the R-122 MKll’s higher sensitivity. All of the mic’s additional output comes from its large, specially wound toroidal transformer – that wonderful thing called “free gain.” The phantom powered circuitry provides impedance conversion only, adding no noise of its own. The R-122 MK’s active electronics put a perfect load on the ribbon element at all times, allowing the microphone to deliver its full sonic potential regardless of the input characteristics of the following pre. Due to its low-impedance output, R-122’s can be used on extremely long cable runs with minimal signal loss. In addition, the ribbon element can’t be damaged by phantom power, miswired cables or electrical glitches. The R-122’s proprietary offset ribbon transducer (Patent # 6,434,252) positions the ribbon element closer to the front (logo) side of the microphone. This configuration gives the ribbon more room to move within the prime magnetic field while maintaining full frequency response during high SPL recordings. It’s an integral piece of the magic of all Royer R-series microphones. The R-122 MKll is every bit as tough as our R-121. It is a first-call mic for electric and acoustic guitars, drum overheads, brass, percussion, electric and acoustic bass, piano, strings, woodwinds, Foley, and many other applications. The R-122 MKll is similar to the R-121, but the faster transient response and larger size of the MKll's audio transformer translates into more open highs and a tighter, more focused low end response. These characteristics make the R-122 MKll an exceptional choice for drum overheads, many acoustic instruments, percussion, strings, piano, standup bass and vocals. As with all Royer ribbons, pushing up the faders on your ribbon-recorded tracks at mixdown is a revelation. When your tracks sound natural and real, there's nothing to fight or “fix” and instruments drop into the mix easily. Should I Use An R-122 MKll or R-121? Because of the R-122 MKll's faster transient response and tighter low end, engineers often choose them over R-121's for drum overheads, acoustic instruments and vocals. R-121's sometimes edge out R-122 MKll's on electric guitars and brass, but it's a matter of taste. If you're recording mostly electric guitars and/or brass, we usually suggest going with the R-121 - it’s less expensive and sounds incredible. The MKll is equally good on these instruments, but you may not need (or want) the additional openness in the highs from the faster transient response, and you certainly won't need the MKll’s higher sensitivity on these high SPL applications. If you plan on using the mics primarily for drum overheads, vocals, piano, acoustic instruments, strings, classical music applications and so forth, we highly recommend going with the R-122 MKll, which will also be excellent on electric guitars, percussion and brass. Due to our patented offset ribbon transducer, the back of the R-122 MKll records slightly brighter than the front side at distances of three feet and closer. This can be extremely useful for recording acoustic guitars, vocals, drum overheads and other sound sources that you may want a slightly brighter response on. 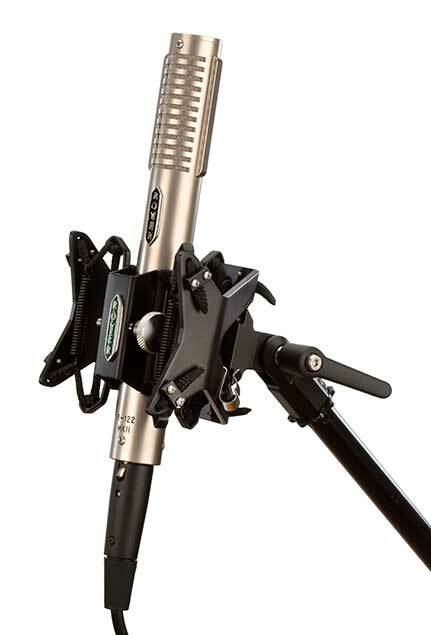 Learn more about it here: 2 Mics In One - Recording on the Back Side of the R-121, R-122 and R-122V. Recording Magazine - R-122 MKII Review by Paul Vkuk Jr.